When I was a child, my parents taught me to embrace two critical aspects of life: family and food. Eating home-cooked Chinese meals as a family everyday allowed us to connect through table conversation and our shared passion for delicious cuisine. Thus, I learned that food does more than satisfy our biological satiety; it serves as a foundation for strong relationships and everlasting memories. 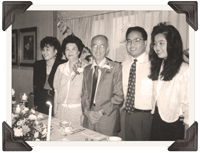 My parents opened Mon Kou Restaurant in 1971 with the firm mission to share our treasured family dining experiences with the local Attleboro community. Over forty years later, Mon Kou has become a renowned establishment that has extended its services to customers all over Massachusetts and Rhode Island. Every day, multiple generations of families and devoted customers walk through its doors, whether it be to relax in a Polynesian ambience or attend a reception in our spacious dining room, which caters rehearsal dinners, anniversaries, birthdays, and numerous other formal occasions. With such a versatile reception site as well as a lounge and a large dining area, Mon Kou Restaurant extends its impeccable customer service toward any occasion you desire. Eat with family and friends, and indulge in our extensive yet affordable menu in a beautiful casual atmosphere. In continuation of my parents’ mission, I, too, hope you savor the food and dining atmosphere with which I was raised. Enjoy, and welcome to the Mon Kou family!